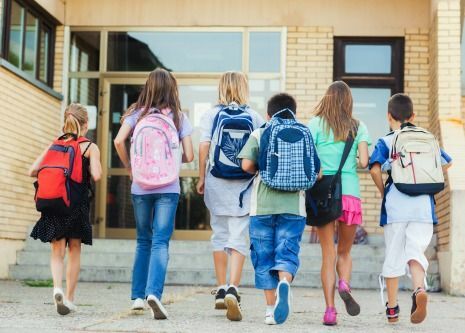 For families with school age children, back to school time often signal hectic schedules overflowing with school activities, kids sports, family activities, and a back to school dental check up. 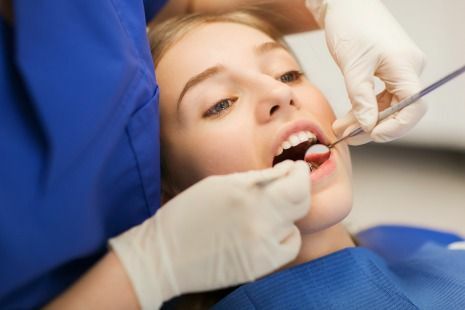 Parents often ask our dental hygienists at their kids dental appointment for any helpful tips and suggestions for how they can motivate & inspire their kids to maintain a healthy smile on their own. We are here to help. Listed below are 6 healthy smile tips for you to share with your kids. as I say, not as I do” does not apply here (sorry). teeth for two (2) minutes. If your child is slow to get moving in the morning or is is a procrastinator, we recommend parents to set their child’s alarm clock accordingly to allow their kids ample time to brush their teeth. During sleep, the mouth lacks sufficient amount of saliva to keep our mouth moist. As a result, the mouth becomes dry and allows for harmful, bacterial dental plaque to form and ferment giving rise to “morning breath” and a “fuzzy” coating on our teeth, tongue, and gums that requires a toothbrush to remove. There are several FREE tooth brushing dental apps available for download in the iTunes or Google Play store. Have your child brush along to their favorite song. BONUS, most are longer than two minutes. Make brushing time a family event, everybody brush at the same time. Many toothbrushes have built in audible timers to help kids learn how long two minutes really is. Hang a tooth brushing & flossing chart with an attached envelope of stickers in your child’s bathroom. At the end of a week or the month, reward your child’s progress. 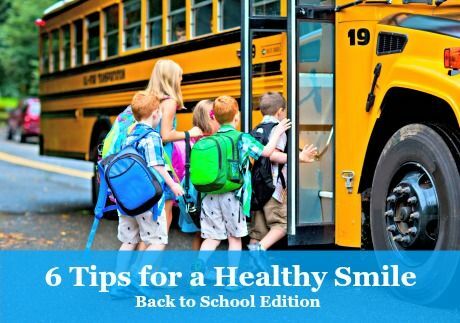 In addition to your packing your kid’s school books and notebooks, we recommend for you to include an on-the-go dental care kit, healthy snack to ward of hunger growls, and bottled water. 3. 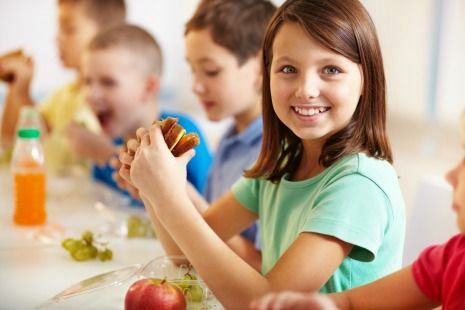 Discuss the importance of eating a healthy school lunch. often translate and impact your child’s food choices in your absence. Teach your child to avoid soft drinks while at school. It’s best to reserve soft drinks and juice for family outings and/or special occasions. Both caffeinated and beverages high in sugar like juice can cause hyperactivity and impact your child’s ability to concentrate in class and are contributing factors for childhood obesity and diabetes. Instead, encourage your child to drink milk and/or water. Milk contains calcium, a critical nutrient that aids in the development of strong bones and teeth. Research shows that soft drinks leach the calcium from our bones which increases your child’s susceptibility to sports injuries and bone fractures. Low bone density also increase the likelihood for developing osteoporosis in your child’s adult years. to protect their smile & help prevent a concussion. An athlete is 60 times more likely to sustain a traumatic dental injury if they do not wear a properly fitted athletic mouthguard while on the field of play. Unfortunately, not all schools, coaches, or leagues require players to wear mouthguards. 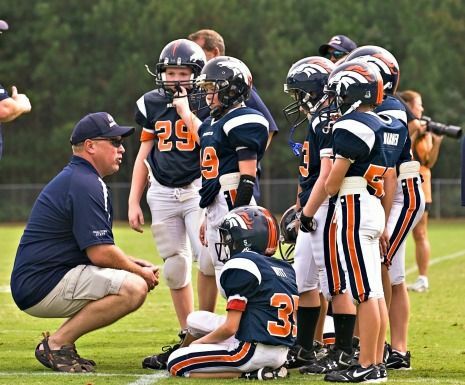 As a result, its up to you as a parent to discuss the risks and encourage your child to wear a mouthguard. estimates the cost of re-implanting a tooth including follow up dental treatment is roughly $5,000. That’s roughly the equivalent of fabricating approximately 83 custom fitted mouthguards! 5. Ensure your child brushes & flosses before crawling into bed. You’re tired after a long day at work and your kids are tired after a busy day at school and after school activities. The nighttime struggle to get your kids to brush & floss their teeth before crawling into bed is real. One helpful suggestion is to encourage your kids to brush and floss their teeth following dinner or shortly after they get home from evening activities. In doing so, they’re likely to brush and floss more effectively than once they become too tired. 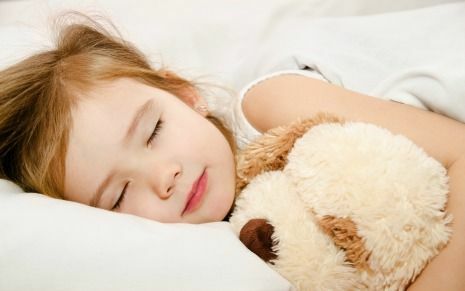 What’s at risk if your child does not brush & floss before bed? This is a frequently asked question by parents. The short answer is ALOT. Every time we enjoy a snack and/or a meal, the bacteria that are naturally present in our mouth essentially feed on our eats. This process creates an acid that can lead to tooth decay. Brushing and flossing before bed greatly reduces acid formation and removes harmful dental plaque from teeth and gums. tooth decay. ACT and Listerine Smart Rinse are two widely available over the counter products. Be sure to read and follow the directions on the label. A prescription strength dental fluoride formulation may be prescribed if your child’s dentist identifies them at high risk for dental cavities. Take a dental impression of your child’s teeth in order to fabricate a custom, athletic mouthguard to protect your child’s smile while participating in their favorite sport. On behalf of the entire Dentistry for the Entire team, we wish your family a happy and prosperous new school year filled with success, fun, and a healthy smile! 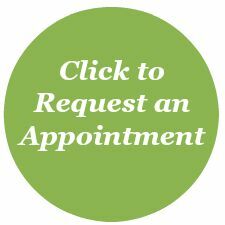 Call (763) 586-9988 to schedule your child’s back to school dental checkup or click the button below to request an appointment. Before & after school appointments are available.